Allison Allen made a career of being someone else. Formerly a professional actor and now a highly sought-after Bible teacher, she knows a thing or two about playing a role. But, she says, all of us play roles nearly all of the time, and it's exhausting. We walk into a room, figure out who we're supposed to be in this context, slip into character, and say the lines we know we should say. We become someone else. Maybe we tell ourselves it's some version of us, but deep down we know this inauthentic role is not what God wants for our lives--and it's not what we want either. 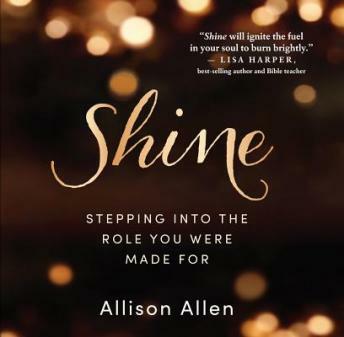 With fascinating personal stories and sharp insight into human nature, Allison Allen calls each woman to drop the brave act and step into the role of a lifetime--being her real self, no matter what the critics might say. She gives women permission to talk about, rather than around, the things they feel, freeing them to step out of the shadows and into the light of God's true calling.